"The tanzanite wasn't the color I was looking for, so Mariel found me the perfect amethyst for the ring! She's so easy to work with - helpful, professional, and superb communication. I look forward to purchasing from her again in the future! "This ring is amazing. The Garnet is stunning and the setting perfectly compliments it. It's truly special and unlike any other I've seen. I have already received several compliments. This will not be my last purchase from this shop. They have a great eye for a gems and can complete a setting with quality workmanship. 5 out of 5 stars." "To date, I have purchased two rings through Mariel that are absolutely top drawer and breathtakingly beautiful. The items they carry never disappoint and are above and beyond in quality and craftsmanship than any photo of the items can show. I consider each piece an investment of a lifetime. The quality of service and attention to the customer is even better. Before I shop anywhere else, California Girl Jewelry is where I know I can find a one-of-kind piece that is forever." "I'm so grateful I met Mariel and her daughter at the San Rafael! My fiance and I went to the Faire to purchase a loose stone to design a ring around and came across their table. I was drawn by the gorgeous designs/selection of the jewelry and was impressed further by the kind, patient, and knowledgeable women. We didn't purchase that day, but I realized shortly after that I could not stop thinking about the women and their jewelry so we made an appointment to meet them again at their SF shop. I was so nervous and anxious about choosing a ring, but Mariel made this process so much easier and stress-free than I imagined it would be. At our appointment, Mariel was again patient with my questions and was not pushy at all. My fiance and I created a ring that day with her help, but when it came in, I realized that my insistence on having rose gold wasn't the best idea (Imagine my panic!). Thankfully, Mariel was understanding and worked with me to get the ring "just right". When I finally received the revamped ring (the turn-around time was AMAZING), I was close to tears... it's so beautiful! I can't recommend California Girl Jewelry enough... especially for something as special as an engagement ring!" "This is the ring I’ve been dreaming of!! I'm so lucky to own it!!! The pictures could not do this beauty justice. It’s sparkling much more in person. Literally I fell in love with this ring. I had great communication with Mariel. All of my questions were answered quickly. She is honest and kind. I’ll definitely shop you again, Mariel!!" "I had the chance encounter of meeting Mariel and learning about California Girl Jewelry, and boy am I glad I did! Not only is their showroom really stylish, but the customer service and customization that they provide is 2nd to none. I highly recommend them for anything from traditional metals and classic designs, to rare stones and unique settings. Really a great place!" "If you're looking for someone knowledgeable about gemstones. This is the place to go. They're so friendly and education. Highly recommend checking out their store. If you don't have time you can find them on Etsy but photos don't do their quality ant justice. Their attention to design and detail is incredible. Highly recommend going and learning about stones that are rare and uncommon. Loved my experience. Thank you!" "What fantastic gems. Both great colour and clarity. The spinel in particular is such a good colour I love the slightly green influence. The sapphire is also good and the pictures didn't do it justice. Both superb as always from you! As you know I have always loved what you did with the Red Spinel. This design on Blue Spinel is even better. Love the details under setting. It's sophisticated and stylish. Amazing. Both beautiful. Fantastic Gems. Great colour and clarity. As always superb quality, design and service." "The pictures and video do not do this ring justice. Even in low light it sparkles with an inner fire and brilliance all its own. The setting provides the perfect frame for this sparkler! My sister and 11 year old niece were visiting and this December birthstone is my niece's birthstone. She is hoping to inherit this beauty!!" "Happy Early St. Patty's Day to me! I am extremely pleased with my purchase. It is exquisite and fits perfectly; thank you for resizing it to fit me! I was even more impressed with the packaging when it was delivered. It was nice to have a little bit of CA delivered to me with a shell on top. It made the delivery special as if I had picked it up in a boutique versus online. Thank you again! I will be back "visiting" soon." "Great contact around item! This is a very nice seller and I am sure you would be pleasured to do business! Would return for future jewelry!" "5 star service and quality! No short changing on quality of diamonds and pictures are true - ring is magnificent. I will be back!" "Had an amazing experience purchasing a jewelry chain from California girl jewelry. Mariel was amazing, from her knowledge of all the different gemstones to her recommendations to the customer service rendered, everything was just impressive. High quality pieces with very reasonable prices. Would definitely make my jewelry from this place from now on." "Had a necklace custom-made for the most special someone in my life, who happens to be my mother! And I was not disappointed, in fact, I was blown away! I knew i would be impressed, but wow was it beautiful! But not only is the quality top notch at California Girl Jewelry, so is the customer service! The lovely ladies who work there are very friendly, sincere and knowledgeable. If you're looking for a beautiful surprise for a loved one, or even something as a treat for yourself, find no better place! I know i'll be back. Would buy everything if i could afford it haha!" First off, I found out about Mariel's delightful little shop and her corresponding products through Etsy! I was obviously a little reluctant to initially put my trust in someone through an online distributor such as them but after speaking with her on multiple occasions she definitely provided the peace of mind I needed to have faith in the entire process. The final product ended up being one of the most stunning custom rings I could of ever laid my eyes upon. I unfortunately made the process even more difficult by changing my mind at least a couple of times but Mariel was always more than accommodating to ensure that my opinion and input was at the heart of the entire process. We ended up creating a custom engagement ring and wedding band for my soon to be wife based off a design I had come across here in San Antonio, TX. We then changed the center stone to something very rare and unique that I actually ordered from another online retailer through Etsy. 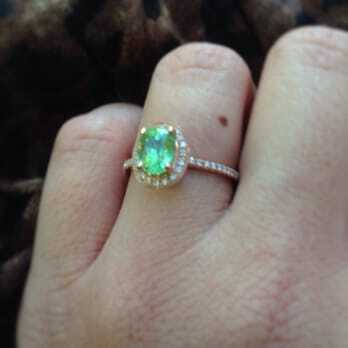 I then sent her the gemstone and what emerged was the perfect ring in my mind. Everything came together beautifully and I couldn't be happier! I know my fiancé is going to love the ring and I can't wait to see the look on her face once I put it on her finger... Thank you again Mariel and thank you to your entire team as well! Also, I'll definitely send you pictures once I figure out something original for my proposal! Unbelievably happy with the jewelry and service I got at California Girl Jewelry's lovely showroom. We had a great day with girlfriends/ and mother/daughter shopping in San Francisco (we started with a fun brunch and then headed to the showroom to look at jewels). I was looking for a nice sparkly ring to wear on my right hand. The designers/owners (a mother and daughter team) were so helpful, kind, and knowledgeable (and did I mention, fun?! They popped a bottle of champagne for us right there in the store). They showed me tons of different styles, but were not at all pushy like some other jewelers who want to make a sale. It is obvious they love what they do, and they pride themselves on making and finding exquisite pieces. I ended up with a gorgeous aquamarine and diamond bling bling ring and I love it! I get so many compliments on it every time I wear it out. Next I am going to have them redesign some of my old jewelry that needs updating. Seriously, this place is awesome!" "Hi! We've received the ring and are so incredibly pleased with how beautiful it is!! Thank you so much for the outstanding service you have given us!!! We will definitely enjoy looking to for future purchases! 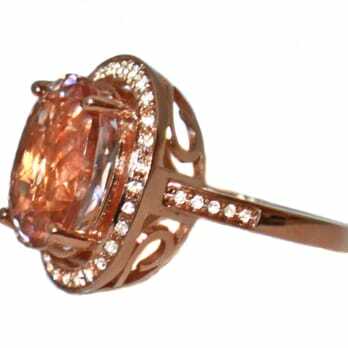 Thanks, Rob & Patti (Beautiful Copper Orange Natural Zircon and Diamond Designer Ring)"
"Wow,Wow, both gemstones are out of this world. The Nobel Red Spinel is so special, never seen such fabulous colour!!! Way better than any Ruby. Love the design / settings, very stylish & sophisticated. Love the colours of Topaz. Rich Gold, Copper. California Girl, thanks to you Mariel yet again produced fabulous quality in every way. "Absolutely beautiful with fire glints in the light. Very unusual and special. Love it!" "I met Mariel at the San Mateo Gem show. My friend and I stopped at her booth to look and we started talking. I have a diamond cross that I never wear and thought it was shame! I didn't really think that I would be able to afford transforming it into something else, but since she was a designer, I had asked her opinion. She was very helpful and spent time with me listening to my concerns. she had drawn up a design and said she could get me an estimate. She mentioned she had a office in SF (it is right near the Westfield Mall on Market). My friend and I often go downtown so we took a trip down to visit her. She did provide me with an estimate and I was surprised to see that it would be within my budget! I was pretty excited. When I ran into her again at the next Gem show, I was ready to have it done! I left the cross with her. About 2 weeks later, I made an appt to come back down and pick it up. I was incredibly happy with the results (I took it from cross to a simple circle). It is really beautifully made. I am very happy and equally happy to have met Mariel and her daughter. I don't have much jewelry but I would be happy to work with her again, helping me transform something else." "I have been shopping for a special piece of jewelry and my favorite stone is sunstone so I went to California Girl Jewelry. They have an amazing selection of original modern traditional designs. The gemstones are gorgeous. I bought a dichromatic (two colored) shield shaped pendant with diamond accents, beautiful rose gold findings and matching chain. The workmanship really impressed me. The proprietors are very gracious. Find this lovely shop and check out the glamorous bling!" "Stunning stone--just as Mariel described. Lots of sparkles and such a unique look." "Hi!!! I'm Julie, my boyfriend proposed to me Friday night and I am SOOOO in love with my ring, it's BEAUTIFUL!!!!!!!!!!!!!!! You are a gifted designer!!!" Beautifully crafted ring, and Mariel was such a pleasure to work with. It is obvious she cares about her clients, and it was very much appreciated. Thank you Mariel, you'll see me again! I could not be happier with the service and the craftsmanship that CA Girl Jewelry provides with their unique pieces. My fiancé (eeee!!) purchased my engagement ring from them and I COULD NOT BE HAPPIER! This is THE ring I wanted so so so badly! Unfortunately, my fiancé planned everything except for the sizing part of the ring...but no worries--I called Mariel at CA Girl Jewelry and she was so wonderful. She assured me that they could size the ring and have it back to me in time to show it off at Thanksgiving dinner! She was so sweet and helpful. I will not hesitate to have CA Girl jewelry design my wedding band! I wanted a unique wedding ring and these ladies by far had the most beautiful unique rings we could find on the internet. I couldn't be happier. I literally can't stop staring at it and neither can anyone else, the compliments just keep rolling in. Added bonus... the customer care and service is outstanding, I will never purchase jewelry from anywhere else again. I had the pleasure of meeting with Mariel last week. Her knowledge of jewelry and gemstones is remarkable! I could have spent the whole day with her. California Girl Jewelry has beautifully designed jewelry or they will work with you to design specifically what you would like. Do not hesitate to contact these ladies. I will definitely purchase from again. I can't stop looking at my beautiful Spessartite Garnet & diamond ring! It's absolutely stunning! Thank you Mariel! I have purchased several California Girl Jewelry designer rings as well as worked with them on custom designs. This jewelry is exquisite and has a lot of detail and high-end design. The stones are of the highest quality as is the workmanship...which is why I am a repeat customer. For the custom designs, Mariel works with me to select the stones and develops the design. It is truly a GREAT experience to get exactly what you want! She is supportive and provides the highest customer service. It is so wonderful to finally find a jeweler that is so knowledgeable and honest. I can't wait for my next purchase! Wow - where do I start? I have two rings and just got two custom made bracelets made from California Girl Jewelry. I will never buy jewelry from anyone else. When she says it is all about the bling...well, it is TRUE. I cannot tell you how many compliments I have gotten on each piece of jewelry I have gotten. Not only are the pieces fabulous, their prices are amazing. Customer service is outstanding, and this mother and daughter team are as enjoyable as you can find! The detail and quality of the beautiful Forest Green Tourmaline ring I just received from California Girl Jewelry is outstanding. The care taken to place this unique stone in a setting to enhance its beauty is evident. Mariel is so helpful and incredibly knowledgeable about her craft. I, now, am much wiser about not only choosing pieces of jewelry but also in caring for them. There is no other place to begin your shopping experience for jewelry than California Girl Jewelry and certainly no other place for me. Thank you for the beautiful ring! Bought a beautiful pair of vintage gold earrings. Very happy with the purchase. Mariel was patient and gave me a great deal. Very accomodating and nice people, would love to do business with them again. I recently purchased two Burmese Jade estate rings from California Girl Jewelry and I couldn't be more pleased with the quality of the rings, and the wonderful, personal service that I received from Mariel. Mariel partnered with me from the beginning. She took time to answer all of my questions, sent me photos and measurements, and mailed the rings on schedule - it was clear that she wanted me to be happy with a purchase. In fact, I had hoped to find one jade ring that I would love, and ended up finding two! I would highly recommend this company to anyone, and personally look forward to working with Mariel again. Mariel was an excellent person to work with for a custom ring. This was my first custom purchase online for something of this monetary value, and of course hesitant to buy something I haven't seen yet. Mariel was excellent at communication of all the details during the transaction. She was extremely patient, taking pictures of stones and sending multiple angles so I would be comfortable with my decision. I would buy another piece from her again without thinking twice. The workmanship was excellent, high quality diamonds, center stone, and refined finish on the ring. She also gives you her honest opinion but leaves you to make your own decision which I love. Very accommodating, and fantastic quality product. Thank you! If you are looking for honesty, integrity and excellence in a jeweler, you've found it with California Girl Jewelry! They are a mom and daughter shop and you can't go wrong working with these ladies--high quality merchandise at great prices. And I can't forget to mention the prompt and professional customer SERVICE they provide. I love my stunning new ruby ring! :) They do custom-design work and, after all, what's better than one-of-a-kind? Mariel was fantastic - she did a wonderful job helping me find the perfect stones and putting them together to make the perfect ring. I found Mariel to be completely trustworthy and correspondance was quick and easy despite the fact that I live in Australia. Working with Mariel was a pleasure and I will definitely be getting in touch with her for any custom made jewellery I'd like made in the future. I just received the most beautiful opal ring with the help of Mariel. She was patient and answered everything I asked. Would love to do business with CA Girl again. I highly recommend California Girl Jewelry. I received my beautiful custom ring today. 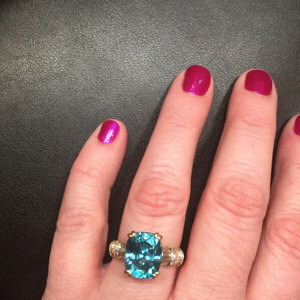 The oval Persian turquoise stone is perfection and the surrounding diamonds and setting are spectacular. This is the first time I have purchased an important piece of jewelry on line. Mariel is a consummate professional who is not only creative and fun but also patient to educate a novice like me about the jewelry business. I got the most beautiful Tahitian pearl necklace from California Girl Jewelry and I absolutely love it! They were so sweet to work with and the pricing was extremely reasonable--I can't wait until the next time I have an opportunity to jewel shop again as this will definitely be where I come back!! I love the bracelet. Everyone at CAGIRL were so nice and very helpful. It didn't fit and had to return it. They were great about everything. Got my refund quickly. Good Company! This is a gorgeous ring and I am thrilled to own it. I loved the wrapped box, too! Thanks so much for the care instructions, too.